Mack and I had to run out to Metro yesterday to buy a few things before the Christmas shopping craze truly hits. We decided to smoke ribs and have a BBQ Christmas dinner this year so I was out picking the ribs up, among other things. Shortly after I got home, the doorbell rang and I was rather surprised when I opened the door. I was expecting my neighbor because I saw he’d accepted a package for us, but it was a woman I’ve never met. She started talking about a box she had in her hand, from a company called Felicitas. I’ve never heard of the company so I wasn’t quite sure what she was pitching, but it turned out to be a free package for young families. 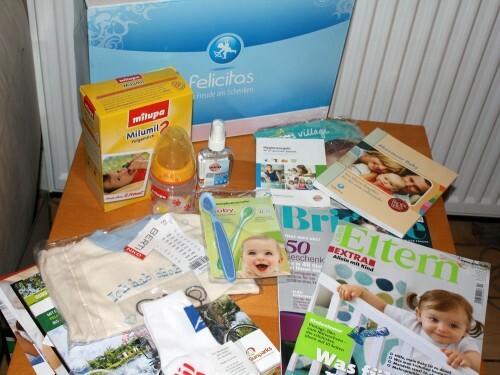 It contained a free baby shirt, socks, a sample of Milupa formula with a free bottle, a feeding spoon and lots of information about various companies that cater to familes with babies. There are also tons of coupons, a recent issue of Eltern magazine, some spray on hand sanitzer and other offers for families. Unfortunately, a lot of the products are (a) for boys (based on the blue color which I can live with) and (b) for a 4-6 month old child. From their website a few informational sheets I found inside, I think they are doing something similar to the company who organizes the info packages you get in the hospital right after you give birth. The products are clearly being donated by large corporations who want families to discover their products and get hooked on them. Every business is out there to make money, right? And it is stated several times that although they will continue to send you products, you have no obligation to buy anything and can write to them to have your name removed from their direct mailing campaigns. So until the free stuff gets to be a hassle, I’ll let them keep sending us stuff. What I’m curious about is how did they get my info? They had Mackenzie’s birthdate as November 23rd, 2008. That was actually my due date but she wasn’t here until the 25th. And I also wonder if they actually have sexed packages or just happen to give out whatever they have in their hand. The same applies with ages. I know it can’t be easy to track all this stuff but you’d think they’d manage something under 6 months, 6-12 months and 12+ months. Especially since they have a special program just for kids over 3. Then again, maybe they do but our package just got confused somehow. It’s rather unfortunate because I really do love free stuff! If you’re in Germany, give their website a glance. Not only do they have the packages for small children and kids 3 and over, but they also have a program for adults over 50. So do yourself a favor before Christmas and go sign up for some free stuff! They came by my house when Amelia was about 5 weeks old, not sure how they got my info, but I’m guessing from the paper…hmmm. It is pretty nice with loads of goodies, but now you’re going to get loads of telemarketer calls…this is where faking that you don’t speak any German comes in handy :). The diaper coupons are AWESOME though! Love that! I love when telemarketers call and give you this long spiel when you say hello. They you just say, in English, “Oh I’m sorry. I don’t speak German.” They totally freak out don’t they? I’ve had some apologize for not being able to give me a survey in English. Poor me for losing out on that opportunity. Since no one really calls us anyway, I might just have to let it go to voicemail when I don’t recognize the number lol. We have Pampers diaper coupons already…they are fantastic. Plus the little book from dm. Love that thing. Just starting down this route shortly so this is great information. This company will definitely track you down later on and try to pitch stuff to you all the time. They even wanted to come by again a few months ago as some sort of follow up. Had to be with both me and my husband (yeah, like that’ll happen)…The meeting never actually took place because the guy got incredibly sick and I guess he’s off bugging people in other parts of Hessen now. But they definitely share you information with people. It’s not an outrageous number of calls or catalogs, though, IMO.